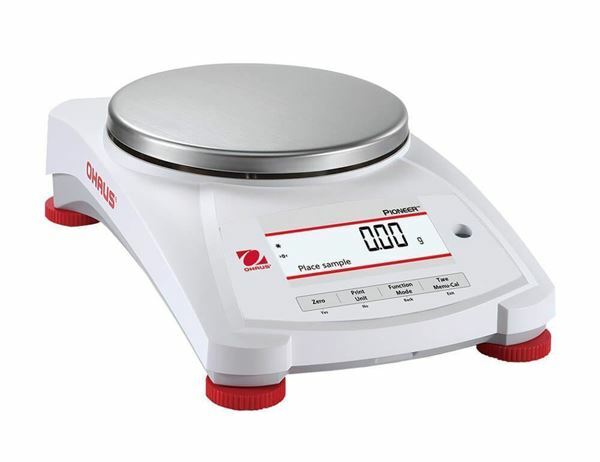 3,200g Ohaus Pioneer Precision Balances, 0.01g Readability - Gilson Co.
OBP-322 Ohaus Pioneer Precision Balance with 1,600g capacity and 0.01g readability is an economical, high-resolution balance for laboratory, industrial and educational applications. It offers 18 selectable weighing units including g, kg, oz and lb. This balance has a backlit Liquid Crystal Display (LCD) which features a second line display for additional information. It is equipped with USB and RS-232 ports for easy connectivity to computers and peripherals. The included AC Adapter allows operation on 100 to 240V/50-60Hz power supplies. OBP-322B has the same features and capabilities but is additionally equipped with internal calibration functionality for calibrating and adjusting with the touch of a button.